Looking up Sheep Pasture Incline from the A6 bridge. Sheep Pasture, Foot of the Incline, taken from the bridge where the A6 road crosses the railway. At the far end of the 9 empty wagons, a water tank (fed from a spring in the hillside) stands on a base of sleepers. 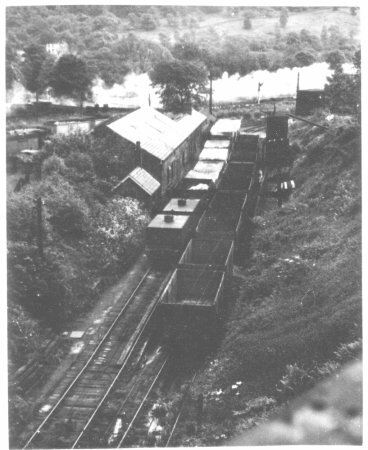 The left line has two water-carrying wagons, which act as ballast for hauling empty wagons to the top. 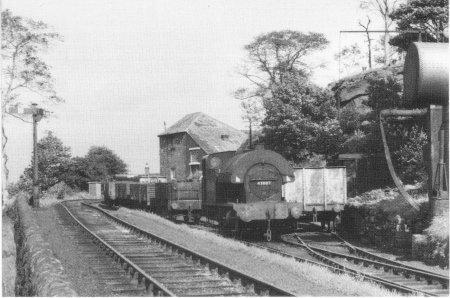 On the left are Cromford workshops and the engineman's bothy. Beyond is the River Derwent and Lea Bridge on the far side. Sheep Pasture top, with 47007 waiting where the engine shed used to stand. 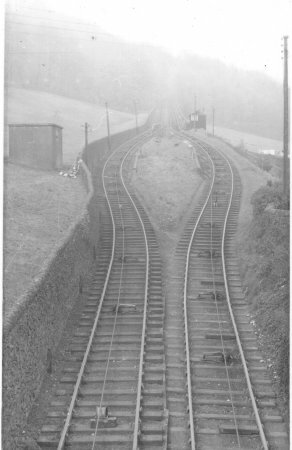 From here the line turns slightly right then plunges steeply down Sheep Pasture Incline. The cylindrical water tank and reservoir to the right, and engine house with lattice window.